Clinicians in the emergency department and other acute care settings frequently encounter patients who have sustained trauma to the lower leg or foot and require anesthesia for repair. Regional block of the saphenous nerve, a pure sensory nerve of the leg, allows for rapid anesthetization of the anteromedial lower extremity, including the medial malleolus. Regional blocks have several advantages compared with local infiltration, such as fewer injections required to attain adequate anesthesia, smaller volume of anesthetic required, and less distortion of the wound site. Because of the lower number of injections, this procedure is better tolerated by the patient and limits the chance of a needlestick injury to the provider. Understanding the anatomical distribution of the saphenous nerve helps when performing a successful saphenous nerve block. The saphenous nerve is a cutaneous branch of the femoral nerve originating from the L2-L4 nerve roots. It descends anteroinferiorly through the femoral triangle, lateral to the femoral sheath, accompanying the femoral artery in the adductor canal, and then courses between the sartorius and gracilis muscles across the anterior thigh. 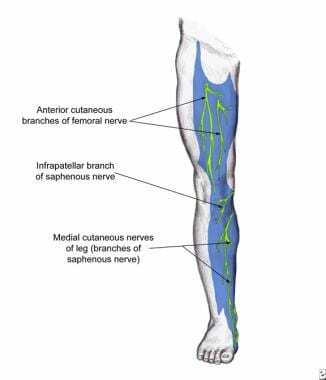 Descent of the saphenous nerve down the anteromedial aspect of the leg. After piercing the deep fascia on the medial aspect of the knee, the nerve courses superficially down the anteromedial lower leg. The infrapatellar branches supply innervation to the knee. The saphenous nerve runs laterally alongside the saphenous vein, giving off a medial cutaneous nerve that supplies the skin of the anterior thigh and anteromedial leg. 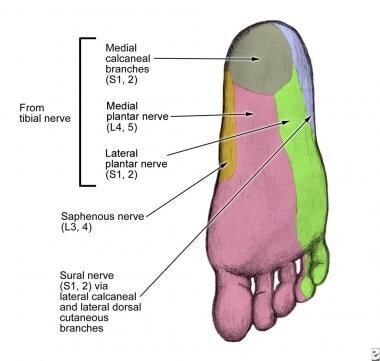 The saphenous nerve travels to the dorsum of the foot, medial malleolus, and the area of the head of the first metatarsal. At the level of ankle, the saphenous nerve is found between the medial malleolus and the anterior tibial tendon, just lateral to the saphenous vein. Saphenous nerve dermatome of the anteromedial leg. Saphenous nerve dermatome at the level of the foot. Lidocaine, the most commonly used anesthetic, has a fast onset of action and a duration of action of 30-120 minutes, which is increased to 60-400 minutes with the addition of epinephrine. [7, 8] The total cumulative dose of lidocaine to be infiltrated is 4.5-5 mg/kg (not to exceed 300 mg) if lidocaine without epinephrine is used, and 7 mg/kg (not to exceed 500 mg) if lidocaine with epinephrine is used. For more information, see Local Anesthetic Agents, Infiltrative Administration. Newer studies have shown that the addition of clonidine 100 mcg to 30 mL of 0.375% bupivacaine (with 5 mcg/mL epinephrine) significantly prolongs duration of the block. The use of clonidine is not yet well-studied, and the authors cannot recommend its use as standard of care at this time. Topical anesthetics may be needed in children or uncooperative adults. For more information, see Anesthesia, Topical. Position the patient supine with the leg externally rotated and the ankle elevated (if anesthetizing at the level of the ankle) or knee elevated (if anesthetizing at the level of the knee). Alternatively, the patient may sit and face the clinician. Perform and document neurovascular and musculoskeletal examinations prior to the procedure. Testing the saphenous nerve prior to block includes sensation of anteromedial thigh and lower leg. See the image below. Expose the knee and palpate to identify the medial femoral condyle and the medial tibial condyle. See the image below. Identify the landmarks: medial femoral and tibial condyles. Prepare the site with antiseptic solution. While maintaining sterile technique, place a skin wheal of local anesthetic using a 25-ga needle. See the image below. Subcutaneously infiltrate 7-10 mL of local anesthetic solution in a transverse line from the posteromedial to the anteromedial aspect of either condyle. See the image below. Anesthetize posteromedial to anteromedial at either condyle. If the leg does not need to be anesthetized, use the saphenous block technique for the level of the ankle. Expose the area of injection and identify the landmarks. Start by palpating the medial malleolus and the great saphenous vein at the ankle. Mark the site 1.5 cm superior and anterior to the anterosuperior border of the medial malleolus. See the image below. Mark the site 1.5 cm superior and anterior to the medial malleolus. Advance laterally in a transverse line toward the lateral malleolus to identify the anterior tibial tendon while the foot is in dorsiflexion (dorsiflexion exaggerates the tendon). Also identify the anterior tibial ridge by advancing further in the transverse line while the foot is in plantar flexion. A divot in the anterior ankle can be felt before the contribution by the fibula is met. See the image below. The divot between the anterior tibial tendon and the tibial ridge. Prepare the site with antiseptic solution. 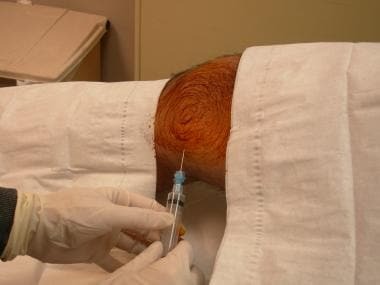 While maintaining sterile technique, place a skin wheal of local anesthetic using a 25-ga needle. Advance the needle through the skin wheal toward the anterior tibial tendon in a superficial transverse line, without injecting the tendon itself. See the image below. In some instances, further anesthesia is necessary (to the anterior tibial ridge) to get a complete block of the area. In children or noncompliant adults, consider using topical anesthetic mixtures, such as lidocaine, epinephrine, tetracaine (LET) or a eutectic mixture of lidocaine and prilocaine (EMLA cream). Adding a buffering solution, like sodium bicarbonate, can significantly decrease the pain of the injection when performing a nerve block. [12, 13] Add 1 mL of sodium bicarbonate (44 mEq/50 mL) to 9 mL of lidocaine. Infection: Infection occurs when the puncture site is not clean. Avoid puncture through infected skin or skin lesions. 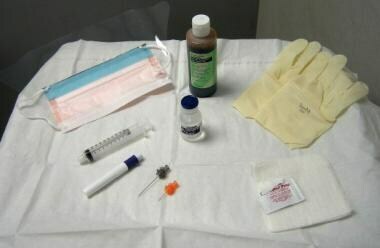 Be sure to use sterile technique during the procedure, as the risk of infection is insignificant when sterility is properly maintained. Hemorrhage: Reports of significant hemorrhage during regional anesthesia are rare, even in patients with blood coagulopathies. A hematoma may develop with intravascular puncture. If prolonged bleeding occurs, attempt to obtain hemostasis with direct pressure and elevation. Exceeding total volume of anesthesia: The volume of 1% lidocaine without epinephrine should not exceed 5 mg/kg. If lidocaine with epinephrine is used, total volume should not exceed 7 mg/kg. Systemic toxicity manifests in the central nervous and cardiovascular systems. [7, 17] Signs such as tremors, convulsions, tachycardia, or respiratory compromise should alert the clinician to stop the procedure and reassess the patient. A short-axis view of the saphenous vein is employed, with the needle directed nearly parallel to the transducer within the plane of imaging. The approach begins at the level of the tibial tuberosity, with the needle entry site anterior to the aspect of the medial leg. Using a high frequency linear probe, identify the saphenous vein and the fascia lata. The goal is local anesthetic infiltration between these two landmarks on ultrasound. A 25-gauge needle can then be directed in a posterolateral fashion to approach the nerve. Use a 14-MHz linear ultrasound transducer and scan the medial thigh 5-7 cm proximal to popliteal crease. Slide the probe until the image of the adductor canal is obtained. The saphenous nerve can be imaged where it pierces the membrane. 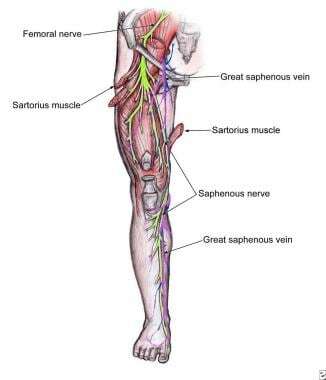 Recall that the saphenous nerve travels deep to the sartorius muscle adjacent to the descending branch of the femoral artery, which may be seen with power Doppler. The saphenous nerve emerges between the sartorius and gracilis muscle tendons, piercing the fascia lata to join the saphenous vein within subcutaneous tissue. Infiltrate 5-10 mL of local anesthetic adjacent to the saphenous nerve deep to the sartorius muscle. A disadvantage of the ankle block is that it usually requires large volumes of local anesthetic. According to Frederickson, these volumes can be reduced with the use of ultrasonographic guidance because of the more precise needle placement and real-time repositioning that such guidance allows. This reference paper states that typical volumes of 30 mL can be reduced to 15 mL for the entire ankle block. Jin SQ, Ding XB, Tong Y, Ren H, Chen ZX, Wang X, et al. Effect of saphenous nerve block for postoperative pain on knee surgery: a meta-analysis. Int J Clin Exp Med. 2015. 8 (1):368-76. [Medline]. Chisholm MF, Bang H, Maalouf DB, Marcello D, Lotano MA, Marx RG, et al. Postoperative Analgesia with Saphenous Block Appears Equivalent to Femoral Nerve Block in ACL Reconstruction. HSS J. 2014 Oct. 10 (3):245-51. [Medline]. Akkaya T, Ersan O, Ozkan D, et al. Saphenous nerve block is an effective regional technique for post-menisectomy pain. Knee Surg Sports Traumatol Arthrosc. 2008 Sep. 16(9):855-8. [Medline]. Benzon HT, Sharma S, Calimaran A. Comparison of the different approaches to saphenous nerve block. Anesthesiology. 2005 Mar. 102(3):633-8. [Medline]. Gmyrek R. Local anesthesia and regional nerve block anesthesia. Medscape Reference. February 7, 2007. [Full Text]. YaDeau JT, LaSala VR, Paroli L, et al. Clonidine and analgesic duration after popliteal fossa nerve blockade: randomized, double-blind, placebo-controlled study. Anesth Analg. 2008 Jun. 106(6):1916-20. [Medline]. Crystal CS, Miller MA, Young SE. Ultrasound guided hematoma block: a novel use of ultrasound in the traumatized patient. J Trauma. 2007 Feb. 62(2):532-3. [Medline]. Luhmann JD, Schootman M, Luhmann SJ, Kennedy RM. A randomized comparison of nitrous oxide plus hematoma block versus ketamine plus midazolam for emergency department forearm fracture reduction in children. Pediatrics. 2006 Oct. 118(4):e1078-86. [Medline]. Reichman EF, Tolson DR. Regional nerve blocks (regional anesthesia). Reichman EF, Simon RR. Emergency Medicine Procedures. New York, NY: McGraw-Hill; 2004. 965-81. McGee D. Local and topical anesthesia. Roberts Jr, Hedges JR. Clinical Procedures in Emergency Medicine. 4th. Philadelphia, PA: WB Saunders; 2004. 541-5. Greensmith JE, Murray WB. Complications of regional anesthesia. Curr Opin Anaesthesiol. 2006 Oct. 19(5):531-7. [Medline]. Haugen RN, Brown CW. Case reports: type I hypersensitivity to lidocaine. J Drugs Dermatol. 2007 Dec. 6(12):1222-3. [Medline]. Ludot H, Tharin JY, Belouadah M, Mazoit JX, Malinovsky JM. Successful resuscitation after ropivacaine and lidocaine-induced ventricular arrhythmia following posterior lumbar plexus block in a child. Anesth Analg. 2008 May. 106(5):1572-4, table of contents. [Medline]. Saranteas T, Anagnostis G, Paraskeuopoulos T, Koulalis D, Kokkalis Z, Nakou M, et al. Anatomy and clinical implications of the ultrasound-guided subsartorial saphenous nerve block. Reg Anesth Pain Med. 2011 Jul-Aug. 36(4):399-402. [Medline]. Gray AT, Collins AB. Ultrasound-guided saphenous nerve block. Reg Anesth Pain Med. 2003 Mar-Apr. 28(2):148; author reply 148. [Medline]. Marian AA, Ranganath Y, Bayman EO, Senasu J, Brennan TJ. A Comparison of 2 Ultrasound-Guided Approaches to the Saphenous Nerve Block: Adductor Canal Versus Distal Transsartorial: A Prospective, Randomized, Blinded, Noninferiority Trial. Reg Anesth Pain Med. 2015 Sep-Oct. 40 (5):623-30. [Medline]. Krombach J, Gray AT. Sonography for saphenous nerve block near the adductor canal. Reg Anesth Pain Med. 2007 Jul-Aug. 32(4):369-70. [Medline]. Fredrickson MJ, White R, Danesh-Clough TK. Low-volume ultrasound-guided nerve block provides inferior postoperative analgesia compared to a higher-volume landmark technique. Reg Anesth Pain Med. 2011 Jul-Aug. 36(4):393-8. [Medline]. Fredrickson MJ. Ultrasound-guided ankle block. Anaesth Intensive Care. 2009 Jan. 37(1):143-4. [Medline]. Kelly JJ, Spektor M. Nerve blocks of the thorax and extremities. Roberts JR, Hedges JR. Clinical Procedures in Emergency Medicine. 4th. Philadelphia, PA: WB Saunders; 2004. 584-9. Macleod D. Ankle. Duke University Regional ABC of the Lower Extremity. Available at http://www.regionalabc.org/lower/block/ankle.php. Accessed: August 23, 2006. Moore K. The lower limb. Clinically Oriented Anatomy. 3rd ed. Baltimore, MD: Williams and Wilkins; 1992. 403-468. Netter FH. Lower limb. Atlas of Human Anatomy. 2nd ed. Teterboro, NJ: ICON Learning Systems; 1997. 502-509. Paris PM, Yearly DM. Pain management. Marx JA. Rosen’s Emergency Medicine Concepts and Clinical Practice. 5th ed. St. Louis, Mo: Mosby; 2002. 2571-3. Richardson EG. Surgical techniques. Canale ST. Campbell’s Operative Orthopaedics. 10th ed. St. Louis, Mo: Mosby; 2003. 3911-4. Schabort D, Boon JM, Becker PJ, Meiring JH. 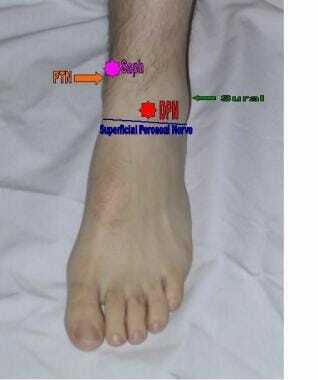 Easily identifiable bony landmarks as an aid in targeted regional ankle blockade. Clin Anat. 2005 Oct. 18(7):518-26. [Medline]. Medial and femoral condyles of the knee. Special thanks to Dr. David Hecht.